At just 23 years old, passionate about precision and determined to create the world’s most accurate timekeeping instruments, young watchmaker Louis Brandt founded a small workshop of his own in 1848, in the Swiss city of La Chaux-de-Fonds. It didn’t take long before his reputation for high quality watches was established within Switzerland, and then shortly after, throughout Europe. Following Louis’s death in 1879, sons Louis-Paul and César took over the family business. Together, the brothers found a bigger home for the growing business by relocating to Biel/Bienne, where the manufacture still has its headquarters today, and started building on their father’s watchmaking legacy under the new company name Louis Brandt & Fils. They introduced the world to the first minute repeater on the wrist, equipped with a groundbreaking miniaturised version of existing pocket watch movements, which chimed the hours and minutes on demand. 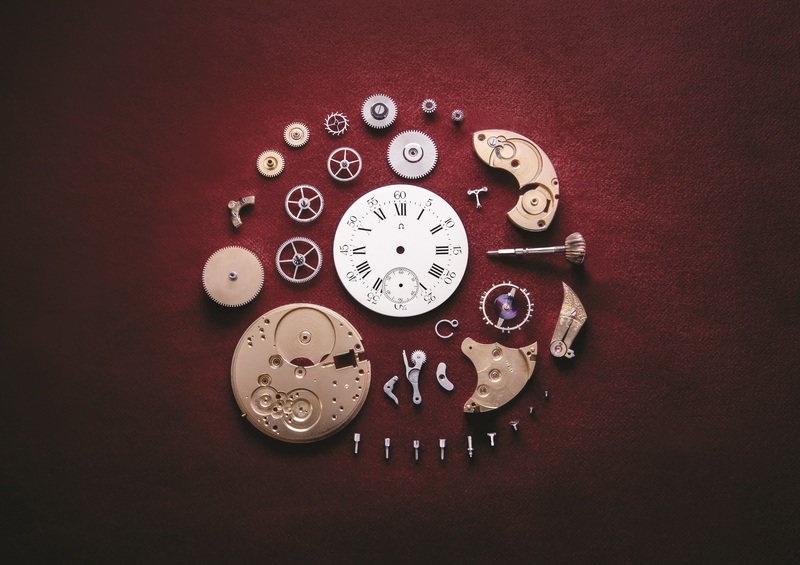 The defining moment came in 1894 when the Brandt brothers released their new movement known as the 19-Ligne Calibre. Marking an enormous leap forward, the calibre was produced in series using revolutionary new methods and it instantly set a new standard within watchmaking. It was not only extremely accurate, but every component could be replaced without modification by any watchmaker in the world. The combination of winding and time-setting via the stem and crown was so revolutionary that it remains to be widely used today. The brothers crowned their new achievement “Omega”. Like the last letter of the Greek alphabet, the “Omega” movement symbolised ultimate accomplishment and was considered the “final word” on watchmaking success as they were sure that precise, series-produced movements were the future of watchmaking. The 19-Ligne Calibre introduced cutting edge mechanisms into watchmaking. Not only did it introduce a method for winding your pocket watch and setting the time only using the crown, it also allowed for industrial scale production. This meant that all the parts were interchangeable, making the assembly of the movements much more streamlined and efficient. The idea was so progressive that it was soon adopted by the entire Swiss watch industry. In addition, the 19-Ligne Calibre was beautifully made, featuring a variety of captivating decorations. One of the most well-known was the “DDR” damaskeening style that enjoyed huge popularity amongst discerning customers in the USA – a technique that remains difficult to achieve. As a true symbol of Omega’s quest for precision to this day, its accuracy was renowned around the world, including on the Canadian railways, where Omega was often trusted to officially keep time in the early 20th century. Today, 125 years later, Omega celebrates the anniversary of its name that symbolises “ultimate accomplishment” by reviving the 19-Ligne Calibre in a new, exclusive pocket watch, as well as releasing a new De Ville timepiece in a very auspicious colour. The 19-Ligne Calibre, known as the famous “Omega” calibre, is being given a new lease of life, as the manufacture embarks on a challenging and impressive project. Since official production of the original movement stopped in 1923, the last components in stock have been stored away for almost a century. Those components have been retrieved from the vaults at the Omega Museum in Bienne and will be used by the watchmakers at the Omega Atelier Tourbillon to recreate 19 new movements. All of the bridges, mainplates, escapements and bimetallic balance spring will be original 19-Ligne components, giving the new calibres a truly authentic and historic spirit. At the same time, Omega is determined to bring the iconic 19-ligne calibre into the 21st century with distinguished updates, such as the barrel, main spring and some screws. The chatons and ruby stones will be recreated and the entire gear train will be recalculated to meet modern standards. As well as this, the movement will be fitted with an innovative Swiss hand-setting system. This will be the first such system in the 19-ligne calibre, offering the next superb evolution of the movement’s functionality. Finally, the movement will be adorned with the same intricate “damaskeening” decoration Omega used in the earliest years of the 20th century, promising exceptional quality. The entire calibre will be assembled with a crown at 3 o’clock and will be placed inside a new half hunter pocket watch. At first glance, the design follows the popular style of the De Ville Trésor gents’ collection. 18K yellow gold has been used to create the 40mm case, along with the domed indexes and elegant hands. For the first time, OMEGA has created a wristwatch with a red enamel dial. This challenging design is inspired by the brand’s iconic colour, and wonderfully matches the burgundy leather strap with tone-on-tone stitching. The beauty then continues on the caseback, marked with “125th Anniversary” on a special 18k yellow gold medallion that is filled with red enamel. Surrounding the medallion is the original “damaskeening” decoration. At the heart is a tribute to the famous 19-Ligne Calibre – the new Omega Master Chronometer Calibre 8929, the first manual-winding Master Chronometer movement created by the brand.